The picture given below clearly illustrates a box-plot. 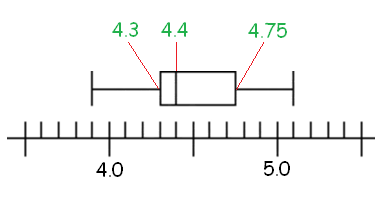 In the above figure, the box spans interquartile range (central 50%). To draw box-plot graph for a data set, we have to know lower quartile, upper quartile and median. To construct box-plot for the given data set, we have to do the following steps. Write the observations of the given data set in ascending order. Find lower quartile, upper quartile and median using the formulas given below. Here, n = number of observations in the given data set. Using lower quartile, upper quartile and median, we have to construct box-plot as given in the above picture. Make a box-plot for the data given below. Let us write the observations in the data in ascending order. Let us find lower quartile, upper quartile and median. Lower quartile comes in between 4th and 5th observations. Upper quartile comes in between 13th and 14th observations. Median is exactly the 9th observation. Using lower quartile, upper quartile and median, we can make box-plot graph as given below. The heights of several students are shown. Make a box-plot for the data. Order the data and find the needed values. Draw a number line that includes all the data values. On the number line, draw dots above the least value, the lower quartile, the median, the upper quartile, and the greatest value. After having gone through the stuff given above, we hope that the students would have understood "Box-plots".